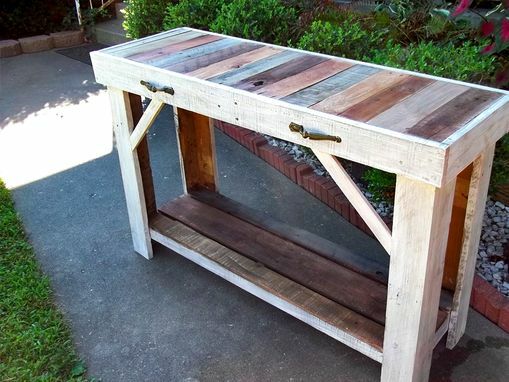 Handcrafted, reclaimed pallet table | entry table | sofa table. 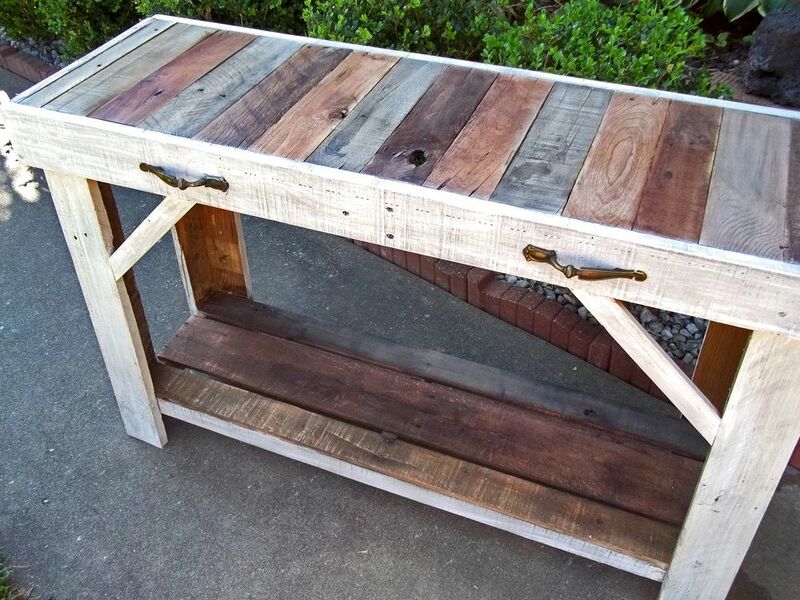 Reclaimed wood furniture. This design features primarily three wood types including Pine, Oak, and Cedar. It features a stunning multi-colored top with light staining that simply enhances the natural color of each board. The body is highlighted in an aged white wash with the bottom rack coordinated to match the top. Perfect for filling that empty space behind your sofa, an entry way, or any bare wall in your living room or office. Designed for those with unique, and trendy decor style -- Shabby Chic, Modern, Rustic, Farm house, Country Cottage, etc. 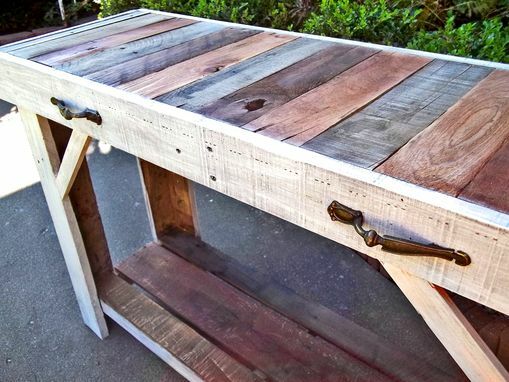 * Each cut of pallet wood is hand selected based on it's natural weathered color, character, and durability. We love knots, holes, and unique pallets that give each table it's own personality. * The table tops are sealed with a clear coat of polly to not only protect your piece, but enhance the natural grain of the wood. * The hardware is also reclaimed and can vary in design, but is also hand selected based on it's age, color, and style. You will select from a variety of hardware that is currently in-stock. * The standard dimensions of our sofa tables are 45L" X 30D" X 16H". This is a reference point and can be changed. Larger sizes will increase the price of the table. * We love taking custom orders! If you already have a different finish, or color in mind, let us bring your idea to life. $99 Flat Rate to your door - anywhere in the lower 48 (US). Your table will be built from start to finish after ordering. There is normally a 3 to 4 week turn around time, but this can fluctuate depending on the time of year. If the table is being shipped, please allow for an additional week depending on the carrier. Finished pictures of your item will be sent prior to shipping.